You signed up for the Fresh Express Salad Swap. You stocked your kitchen with everything you need to make the Swap recipes. You’re following other #saladswap participants on Facebook and Twitter. So you’re all set to go, right?! Not so fast. We want you to start the Salad Swap on the right foot so your journey will be an easy, stress-free ride. The most important thing you can do to achieve this is to plan ahead. People who plan meals and grocery shop in advance are more likely to eat healthier and avoid overeating or eating the less healthy stuff when hungry. Even if you change up the plan mid-week, having a set meal plan will help you stay relaxed and get dinner on the table even on the most stressful day. 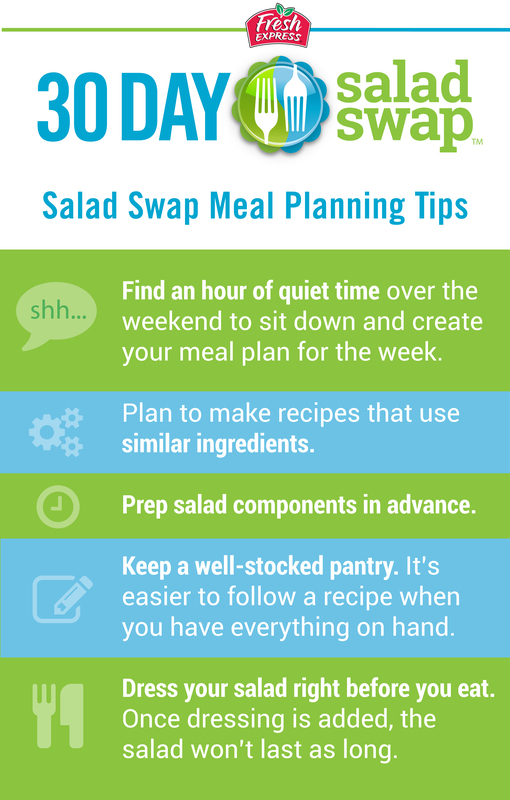 Here are five meal planning tips that will help you meet the 30 Day Salad Swap with success! Find an hour of quiet time over the weekend to sit down and create your meal plan for the week. Scroll through the Fresh Express Salad Swap app on your smart phone and choose the salad recipes you want to try for the week. You may also want to see what’s on sale at your favorite supermarket to get the most bang for your buck! Write an actual plan and hang it in your kitchen or office or log it in the app so you can refer back to it. Then you can make an associated grocery list that includes all the ingredients you need to fill in for those recipes. To give you a head start, check out the meal plans and associated shopping lists already created by the 30 Day Salad Swap team! Plan to make recipes that use similar ingredients. This way you can get the most use out of a bunch of cilantro or a red onion before it goes bad or cook a batch of grilled chicken breasts that can be added to recipes throughout the week. For example, the Chicken Tortilla Salad and the Chicken and Quinoa with Cumin Vinaigrette share ingredients, which makes them a perfect pair to have in the same week. Prep salad components in advance. Over the weekend, or whenever you have the most time, make the dressings you will be using throughout the week, hard-boil a batch of eggs, slice peppers and onions, and blanch green beans. Keep each ingredient in a separate container to last longer. You can also grill steak, chicken, and fish a day or two ahead or make a batch of Mini Burger Balls and freeze them for a busier week. Keep a well-stocked pantry. It’s easier to follow a recipe when you have everything on hand. Almost every salad dressing in the Swap calls for extra-virgin olive oil, so you’ll want to have a bottle or two in your pantry. Other salad ingredients to keep around: canned beans, raw nuts, breadcrumbs, cooking spray, vinegars, and a variety of grains. Dress your salad right before you eat. Once dressing is added, the salad won’t last as long. If you wait to add the dressing to the serving of salad you are eating, you can enjoy leftovers the next day (or two!). Another tip: don’t cut tomatoes into the salad unless eating it all at once. Once tomatoes are cut, they oxidize the lettuce and turn it brown. Juicing vs. Smoothies: What’s the Difference?